Entertaining the whole family can be a difficult task, but Chicago makes it easier by offering a wide variety of activities for all ages! With all of the opportunities for fun, your whole family is sure to have a memorable summer in Chicago. As the summer winds down it can be hard to think of new, fun and exciting things to do, making this list of activities a life saver. You’ll want to jump on the opportunity to tackle these awesome experiences right away! The Chicago Parks District’s annual lineup for Movies in the Parks is sure to please the whole family. This year’s schedule includes 217 screenings in parks across the city, from Rogers Park to Hegewisch. The lineup includes kid-friendly hits like Sing, Moana and more. Pack a picnic and get comfy with the whole family! Tap into your inner Van Gogh with specialized art classes for kids ages 2 to 12. The Color Wheel teaches Fine Art Classes to children in a specialized and unique manner with a main focus on cognitive development. These classes will help teach your kids to engage in a sensory wonderland of critical thinking through color, line, texture and written word. Experience a true bilingual musical event with a Chicago Kids Company show at the Stahl Family Theatre. The Ugly Duckling is a one-hour musical following a new duckling at Lucky Ducky School named Sophia who isn’t quite the same as the other little ducks. This musical is great fun for both English and Spanish speakers – everyone will enjoy this tale. Check it out and learn about the wonderful tale of acceptance! 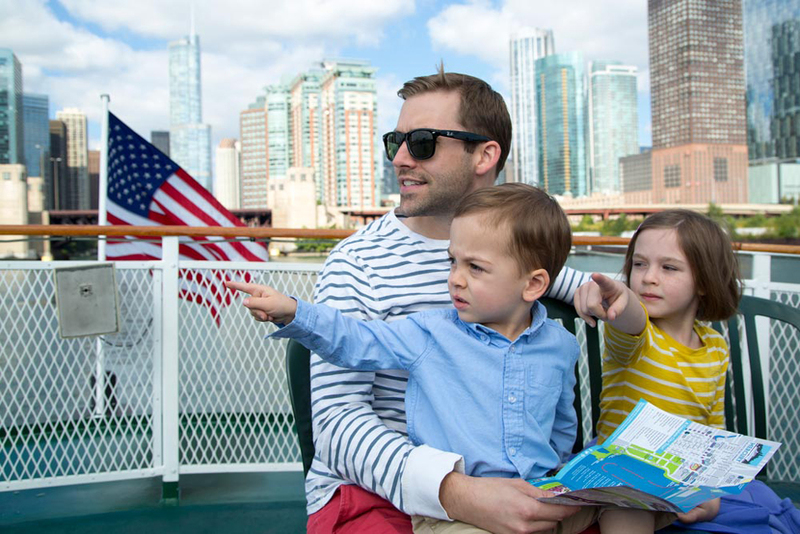 Take in what the city has to offer with an exceptional Chicago River and Lake Tour aboard Mercury, Chicago’s Skyline Cruiseline. During the 90 minute tour, you’ll see Chicago’s glorious skyscrapers, historic buildings and modern marvels. Catch the evening tour and see Chicago by night! On Wednesday and Saturday evenings join in on the 3D Fireworks Cruise. This is an experience the whole family will never forget. Beat the heat this summer and get the creative juices flowing by attend the Emerald City’s Little Theatre. With an interactive journey through the world of nursery rhymes, this show is sure to surprise and delight. The show is geared towards kids 5-and-under. Come see improvisational actors from Chicago’s Storytown troupe, and join in on the music and fun. Children ages 3–9 years old will be encouraged to participate in live performances. Throughout the summer, Chicago has a wide range of family-focused fun runs and stroller races perfect for the whole family. Start a healthy, positive tradition with your kids by getting them up and moving… and for a good cause! Get the whole family involved this summer with these fun runs – from color runs to caped runs, this is sure to be an activity the kids won’t forget.